The 2014 hockey season is over … so let all the contract games for 2015 begin. Hey, remember when that one team won the Stanley Cup? Seemed like a good team; I think they wore black. I seem to recall something about a grumpy coach who took off his shirt during the parade, although that may have been a nightmare I had. But it’s easy to forget all that these days. After all, the Stanley Cup final ended 10 days ago, and that’s quite a while in the NHL at this time of year. We’re now firmly into offseason mode, and the next few weeks are the busiest of the year for NHL front offices working toward reshaping their franchises. By the end of next week, rosters around the league will look very different than they do right now. Some teams will have transformed themselves into contenders; others will tread water; and a special few will manage to ruin any chances they had. Here’s a guide to what to look for between now and then. The first order of business is the buyout period, which has already started. Buyouts can fall into two categories, and while players can also be bought out the old-fashioned way, accompanied by a cap-hit penalty that lasts twice the number of years remaining on their deal, the real focus will be on compliance buyouts. Last year’s CBA gave each team two compliance buyouts,1 and this is the last year they can be used. A player who receives this kind of buyout still gets his money, but his cap hit disappears from the books. Also sometimes called amnesty buyouts. It’s a two-step process, with players first needing to clear waivers before a team can make the buyout official. Several players hit the wire over the first few days, including Aaron Rome, Jordin Tootoo, and David Booth; we also saw the merciful end of the Ville Leino era in Buffalo. But the biggest news broke late last week. First up came the Rangers’ buyout of Brad Richards, whose impending doom was an uncomfortable side plot of the Rangers’ Cup playoffs run. His age (34) and contract (six years left at a $6.67 million cap hit) made the move inevitable, and having his ice time cut in the final basically sealed the deal. He’ll land on his feet somewhere, but the Rangers really had no choice. The Kings faced a similar dilemma with Mike Richards, although he was never the sure thing his Rangers namesake seems to be. But he owns a similar contract2 and really seemed to have lost a step during the team’s playoff run. You’ll note that I said “owns,” as in present tense — the team eventually ended the speculation by announcing that it wouldn’t be buying him out. Six years left at $5.75 million. Martin Havlat, San Jose Sharks: The onetime star was a healthy scratch during the playoffs and carries a cap hit of $5 million next year. On a team looking to make changes, this one’s an easy call. He’s gone. Ryan Malone, Tampa Bay Lightning: Declining production mixed with problems off the ice and a $4.5 million cap hit mean that, like Havlat, he’s all but a sure thing. Marc-Andre Fleury, Pittsburgh Penguins: If he’d struggled again in the playoffs, Fleury probably would have been another easy call. Instead, he played fine, and that could be enough for the Penguins to hold on to him. Pittsburgh has a new GM, and has indicated it may not use its buyouts at all. Also working in Fleury’s favor: His deal expires after next year. Ryan Kesler, Vancouver Canucks: Kesler reportedly asked for the Canucks to explore a deal at the trade deadline, and it was a mild surprise when he wasn’t moved. Since then, the team has fired its coach and GM and brought in Trevor Linden to rebuild to organization. There was some thought that the new era could lead Kesler to change his mind, but apparently that isn’t the case, as he’s still expected to be moved. He’ll be in high demand; expect the Ducks, Flyers, and Penguins all to be in play. Jason Spezza, Ottawa Senators: The Senators’ gradual and somewhat mysterious descent to floor-team status3 will continue with the trade of Spezza, the team’s captain and highest-scoring forward. He’s only 31, but he has a lot of NHL miles on him and a history of back problems, and he’ll be looking for a long-term extension. He has a limited no-trade clause, and the Senators apparently don’t want to deal him within the Eastern Conference, but the Ducks and Blues both look like good fits. The Flames don’t, but they keep being mentioned, too even though Spezza said he won’t be traded to another Canadian team. Owner Eugene Melnyk is adamant the team won’t spend anywhere near the cap. Joe Thornton and/or Patrick Marleau, Sharks: After yet another playoff flameout, the Sharks finally seem ready to blow up the core that’s made them one of the best regular-season teams of this generation. That could mean moving one or both of their All-Star centers.4 Both are signed through 2017 and have no-trade clauses that will limit San Jose’s options, but GM Doug Wilson sure sounds like he’s set on moving at least one. We’ve covered the potential danger in this type of thinking. Cam Ward, Carolina Hurricanes: Carolina has already made changes at coach and GM, and Ward could be the next to go. The goaltending market is tight, and Ward’s $6.3 million cap hit through 2016 is ugly. 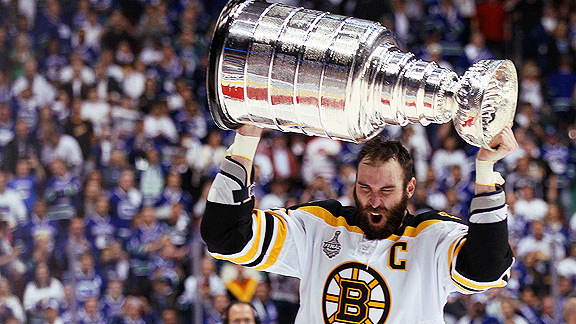 But he has won a Cup as a starter, and some teams still find that ring irresistible. Evander Kane, Winnipeg Jets: Winnipeg is apparently ready to consider moving just about anyone, and Kane would be the most attractive piece the team could offer. Moving a 22-year-old former 30-goal scorer on a reasonable contract doesn’t seem like the sort of move a rebuilding team should be looking at, but Kane has had his difficulties in Winnipeg and might appreciate a fresh start elsewhere. If so, it’s hard to see the Jets coming out ahead on this one. I suppose this guy did OK.
One point to remember: While the start date for free agency returns to the traditional July 1 this year, teams now have a window to work on contracts with free agents beginning June 25 and can discuss parameters of a potential deal starting then. There’s still some confusion over exactly what that means — last year, the league had to clarify that teams couldn’t actually agree to deals before July 1 — but it should result in a busy day on July 1, as several players will have already made up their minds about where they’re going. Although it will get a boost from any players who get bought out. Thomas Vanek, Montreal Canadiens: Vanek played for three teams last season and was traded twice, from Buffalo to the Islanders to Montreal. He also reportedly turned down an extension with the Islanders in the $50 million range. He’s unlikely to get that now, thanks to an uneven playoff run with the Canadiens that saw him criticized for a lack of intensity. It’s been widely assumed all along he’d end up in Minnesota, but that’s started to look less likely. He’ll get a big deal somewhere, since he still had 68 points this year and, at 30, he’s younger than most of the rest of the free-agent class. But he’ll have to settle for less than he could have taken to stay in New York. Marian Gaborik, Los Angeles Kings: If Vanek is the cautionary example of a guy torpedoing his own value with a lackluster playoff run, Gaborik is the opposite. After leading the league in postseason goals, he can probably write his own ticket. That said, he may not want to — there’s talk the Kings want to bring him back, and they should have the cap space to do it. Paul Stastny, Colorado Avalanche: He’s the best center available in free agency, but the glut of players at the position through the trade market could push him to plan B status for some teams. He could still end up back in Colorado, although the Avs are already stacked at center. If he moves elsewhere, expect him to get a long deal that comes in at a cap hit near his current $6.6 million. Ryan Miller, St. Louis Blues: Remember the Ryan Miller trade watch, and the midseason bidding war it inspired? It’s amazing what a rough few months can do to a goalie’s perceived value, because Miller enters free agency as a nearly forgotten man. There aren’t many teams that need a starting goalie right now, even one with Miller’s impressive résumé. The Sharks could end up being a good fit. In other words, the “guys who need new contracts but aren’t unrestricted free agents” group. The CBA tends to tilt the balance of power in favor of the teams here, and the unwritten rule against signing offer sheets usually means we don’t see any. But that doesn’t mean these players can’t move, and the good ones will get paid one way or another. P.K. Subban, Canadiens: Subban was considered a talented but raw young defenseman when he tried to work the Habs for a long-term deal two seasons ago. He didn’t get it, eventually agreeing to a two-year bridge deal. Since then, he’s won a Norris and was the breakout star of this year’s playoffs. His new deal should be huge and could make him the highest-paid defenseman in the league.8 There was talk earlier this season that the Canadiens might trade him, but it’s almost impossible to imagine that playing out now. If these reports of his asking price are true, the Habs should sign the deal today. Ryan O’Reilly, Avalanche: This one could get messy. The Avs elected to file for arbitration with their young center, a move that’s allowed by the CBA but is relatively rare. That means they could wind up bringing him back on a short-term deal, paying him less money than he on his last contract, which you’d have to think wouldn’t go over well. Remember, O’Reilly signed an offer sheet with Calgary back in 2013,9 so the relationship was already complicated. Business is business and it could all work itself out, of course, but there’s a decent chance this ends in a trade. If so, teams will be lining up for a shot at O’Reilly. Thanks to guys like Jonathan Toews, Anze Kopitar, and Patrice Bergeron, elite two-way centers are more valued now than they’ve ever been, and the 23-year-old O’Reilly is one of the few guys who could stake a claim to joining that club. Which, it turned out, actually wouldn’t have resulted in him playing for the Flames. The draft: We’ll cover this in more detail in the coming days, but the entry draft will be held in Philadelphia on Friday and Saturday. This year’s crop doesn’t feature a consensus top choice, so there’s plenty of intrigue around the first overall pick. The team that holds that choice, the Florida Panthers, has made it known it’s looking to deal. You hear rumors about the first overall pick being moved every year and it almost never happens, but there seems to be more chatter this year than usual. The awards: After a lockout-inspired break last season, the league’s annual showcase of bad jokes, B-list celebrities, and uncomfortable players making speeches returns to Las Vegas tomorrow night. There’s not much suspense around the MVP this year (Sidney Crosby will win in a landslide), but the Norris and Vezina votes should be close. The coaching carousel: Two more teams found coaches late last week, with the Panthers picking Gerard Gallant and the Hurricanes hiring Bill Peters. And the Canucks announced the hiring of former AHL Texas Stars boss Willie Desjardins earlier today. That still leaves a vacancy in Pittsburgh. And of course, the Leafs still need to hire those fabled assistants who are supposed to come in and somehow fix the Randy Carlyle regime. It’s also worth noting that all this seems to have left former Penguins coach Dan Bylsma out of the mix, which is a bit of a surprise given his résumé. It looks like he’ll get to take a summer off before heading into the season as the de facto rumored replacement for every coach who loses back-to-back games.